It's been a while since posted about anything I have made. Which doesn't mean I didn't make anything. Not at all. In my wardrobe, most things are made by me with the notable exeption of t-shirts. Untill I bought my serger, sewing jersey was an absolute nightmare, that's why. This winter, I noticed I needed more fun basic pieces for layering. I have loved making jackets ever since my first self drafted one a year and a half ago, and I love dressing down my shapely, formal jackets by wearing them over t-shirts. I had two old t-shirts, one bought, one a recycled band-shirt which belonged to my boyfriend in its previous life, doing that job. So, I needed more. And I could use a simple cardigan with long sleeves (I often make cardigan-like things from odd bits of fabric and that always seems to result in three quarter length sleeves at the very most). The fabric I used is a cotton double knit jersey. It was for sale at the market (2 euros a meter, but only 1,20 m wide) in a very limited choice of colours. I ended up buying (over the course of several weeks) 2 m of each of the fairly dark and grey colours (this is the lightest, I already made a dress out of the blue/lavender/grey and the dark grey/brown is still in my stash). I made the cardigan first. The pattern is based of my knit sloper, I just opened it up along the center front and cut out a deep, wide V-neck. I was going to do a 'normal' closure, with a buttonband along the straight bit of the front, but decided on differently when I had sewn together the body parts and tried it on. Not wanting to put a partly cut length of fabric back in the stash, I moved straight on to making t-shirts. One has cap sleeves and wide neckline, the other is a bona fide skinny fit tee. Even before I cut the fabric, I realised that what I really wanted for under my jackets, where printed, or otherwise decorated shirts. So, I decided to do something which I hadn't done in quite a while: decorate. Cap-sleeves has a 'necklace' of miss-matched mother-of-pearl buttons from my grandmother's box. 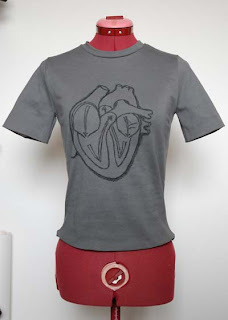 Skinny T sports a drawing (in black textile marker) of an anatomical heart. I'm rather pleased with both of them and looking forward to find out how they will perform in real life. I like how the different decorations give a totally different feel to each of those t-shirts. And I just looked back at the link of your dark blue dress and its beautiful. Looks really good on you! Just found you through Wardrobe Refashion. I love what you did with the gray fabric. 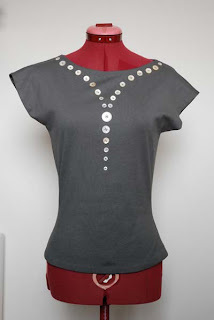 And being a button lover myself, I absolutely adore the use of butons on the t-shirt. Great job. I love the buttons on the tee shirt. It's done in a wonderful and pleasing graphic pattern. And the heart drawn on the tee? excellent! Nicely done. 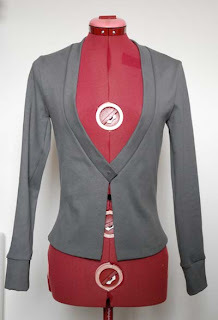 I love the cardigan and it's deep neckline! its beautiful. Looks really good on you! Very nice! The cardigan looks great the way it is, good choice. I also agree with the need of pieces for layering, just my plan at the moment (remains to see if it will be realised).